But here is something I have been recently thinking about . . . if the gospel is an intellectual proposition, the church would need philosophers . . . but if the gospel is a narrative that is historical, supernatural and revelatory, the church would need phenomenologists. Now I don’t mean to create polarities here, especially between two things that should not be separated. The birth, death and resurrection of our Lord Jesus Christ is at once a historical narrative and a true proposition. In fact, the two could not exist without the other. Preachers who preach “propositionally” also use stories (usually at the beginning, the end, and short illustrations to prop up the propositions) and likewise, “narrative” preachers who launch out from the narrative flow of the Scriptures usually arrive at certain propositional truths. I am not even saying here that one is necessarily better than the other. But if the emerging church is correct in saying that there is a noticeable shift from a propositional understanding of Scripture that focuses on true statements that need to be assented and affirmed to the sweep of historical narrative of the supernatural Christ event . . . (still with me??) . . then the people who carry that message will probably also reflect a shift. And that shift might be . . . from philosophy to phenomenology. If this is true, we would expect to see Seminaries shift in this direction also. They are currently handing out lots of PhD’s and probably will for a long time to come. But what would happen if phenomenology replaced philosophy, or at least rose up to give it a run for its money? One of the best phenomenologists I have been reading is Jean Luc Marion, a French intellectual who believes in Christ. Marion builds on previous work by Heidegger and Hurssel, argues their limitations, and takes the discipline into a new place where revelation can be discussed from another angle. 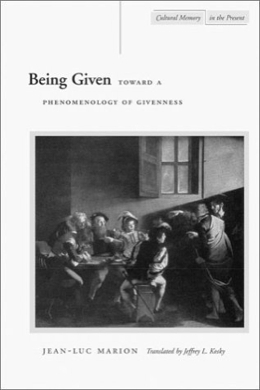 Marion’s best book on the subject is Being Given: Toward a Phenomenology of Givenness, which continues his thoughts from an earlier book, God Without Being. Which brings me to Peter at Pentecost who is delivering the first official sermon of the new church birthed by the Holy Spirit. As the supernatural phenomena become evident to all, Peter stands and says “Fellow Jews, and all of you who live in Jerusalem, let me explain this to you” (Acts 2: 14). At that moment, is Peter doing the work of a phenomenologist? As I was reading your post, I thought of the story recounted in Acts 20:7-11. Paul preached until midnight. Some translations render “preached” as “reasoned”. Eutychus got tired, fell asleep, fell out the window to the ground and died. Paul fell upon (embraced) him and Eutychus was raised from the dead. Paul and the group ate and sat around “conversing” until morning. I see the first speech by Paul, his formal propositional preaching, as filling the role of philosopher, sociologist, religious historian and storyteller. The second part of the evening, the part after Eutychus’ unfortunate accident and miraculous resurrection, as Paul filling the role of what? Translator? Explainer? Phenomonologist? Maybe. i usually don’t think deep enough to ponder things like this. 🙂 the whole point of Jesus coming, the Holy Spirit coming, and every crazy thing that has come of it since is to reveal the Father and allow us to know Him. the more i think about it the more the whole phenomonologist concept makes sense. i have lately seen God moving the laws of the natural to bring healing and deliverance to those that need a revelation of His passionate affection for them. just as in acts 2 when they all came pouring out of the upper room, and just as raymond alluded to at the end of his post i think the explaination of the miracle is as vital as the miracle itself. Dallas Willard started out as a Baptist minister and very quickly found out how little he seemed to be able to actually help people. He felt drawn to philosophy because it was the philosophers who were talking about the things he wanted to talk about, things he thought would be useful in ministry to real people. One thing let to another (God led in it all) and he ended up specializing in Phenomenology and is one of the world’s experts on Husserl. He is also a mentor to many emergerging leaders in the US. Here’s a link to a short address he gave including a bit of his testimony in this regard. Living in the land of Ricoeur, Marion, Derrida and the rest of them makes me want to jump in here. Now if you want to remain in the realm of philosophy it could be that the positivist school could be placed in opposition to the phenomenologists. Don’t know if this helps and I’m sure that it interests a just a few philo geeks. Always like reading your stuff. Keep up the good work. yeah – agreed. the two are connected under the same category. you mean that heretic from belfast? yeah – i was talking to pete about this very subject 2 weeks ago at Greenbelt Festival and i asked him this same question. He agreed that the shift is underway. Don’t have time to read everything here today, but also saw this today and thought it might be of interest, in a theonological kinda way. Would really be interested in Mr. Rollin’s thoughts. His talk at GB was brilliant. PS Andrew, it was great to finally meet you at GB this year, although I got the impression you hate me. Well, tolerated at best. i just felt a little ashamed that i did not know you better – of course we had connected once or twice on the internet – and we share many texas connections and the same friends – i realized i had not spent enough time on your blog or with you and so i guess i was on the defensive and was kicking myself. i hope the next time we meet will not be in a crowded room but over a drink. Interesting post, Andrew. Were you aware that Pope John Paul II was a professor of phenomenology? His writings ring with phenomenology roots.